Q: How can I create a text field that can grow on the page when there is more content than can possibly fit on the text field? A: You can’t really create a field that grows using standard PDF forms but you can use a text field with a multi-line property and a font size set to “auto”. This will allow the size of the font to be automatically resized to a smaller size so the text fits into the field bounds. Below is an example showing the difference between a multi-line textfield with and without auto font size. Multi Line Text Field with a specific font size. A little component for “…” indicates that there is more text to read. 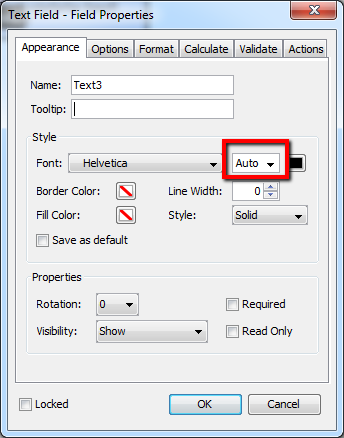 Multi Line Text Field with Auto Font Size: the font size will shrink to accommodate more lines. 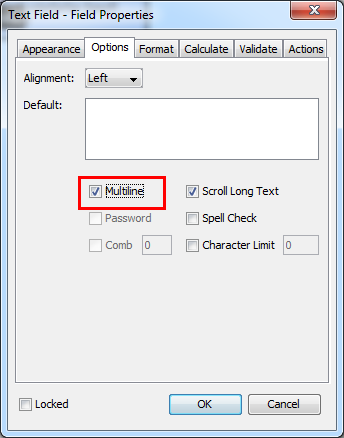 Multi Line Text Field with Auto Font Size. When the font size becomes too small, the “…” component will show to indicate that there is more text to read.